We thank you for visiting our website. 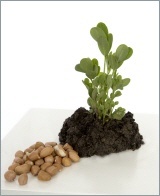 We would like to introduce ourselves as a manufacturer of processed groundnuts. For more than 55 years we provide the European bakery, chocolate, ice and muesli branches with sliced, diced and roasted peanuts. The product can be manufactured to the customers specification, which allows the customer to add value to his own product. The special European regulations regarding groundnut kernels are carefully applied. Tasty applications can be found at the recipes.